The world has dismissed the Syrian presidential elections as “a parody of democracy,” “a mockery, a tragedy,” and “a farce, they’re an insult; they are a fraud.” The United Nations has warned that the elections will “damage the political process,” and the fact that the Syrian regime has pushed forward with elections is one of the primary reasons for the recent resignation of veteran UN negotiator Lakhdar Brahimi. 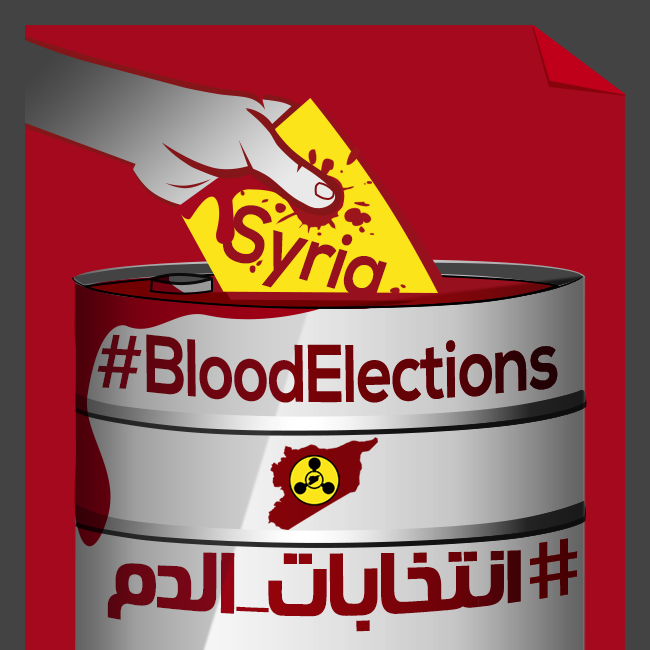 The Syrian Opposition Coalition has called for a boycott of the process (which they refuse to even call elections), while activists online have started a #BloodElections movement. In light of this backlash it is important to take a critical look at how these elections are being run, and how they fit into the larger strategy of the Assad regime. Syria has never held democratic elections. Presidential referendums in Syria have served to reinforce the power of the Assad family since the late Hafez al-Assad won his first uncontested referendum in 1971 with more than 99% of the vote. Under the 1973 constitution the Syrian Ba’ath Party formally entrenched its role as sole leader of the state. A handful of regime-tolerated parties were allowed to exist under an umbrella movement called the National Progressive Front, in order to present a thin veneer of pluralism. Their existence has had no impact on Syrian presidential elections, as they have never been allowed to field a candidate. This system of single-party dictatorial rule was passed on from father to son when Bashar al-Assad assumed power in 2000 following his father’s death. Presidential referendums in Syria are still held every seven years, and continue to be rubber stamps for the regime. Bashar al-Assad received over 97% of the vote in unopposed referendums held in 2000 and 2007. Assad’s current seven-year term ends on July 17, 2014, and by law, elections must be held between 60-90 days before term ends. The presidential election date has been set for June 3. Two opposing candidates, out of the 24 who applied, have been approved to run by Syria’s Supreme Constitutional Court. The Supreme Constitutional Court was created in 2012 and all members are selected by Assad. Both of the approved competing candidates – Maher Abdul-Hafiz Hajjar and Hassan bin Abdullah al-Nouri – are associated with the regime-tolerated internal opposition. In 2012, with the regime under increasing pressure as the uprising turned into full-fledged civil war, a new constitution was enacted which allowed the existence of weak opposition parties that could field presidential candidates for the first time. Accordingly, the coming vote will technically be Syria’s first multi-candidate presidential elections in history. Under normal circumstances a change like this – superficial though it may be – would be considered a baby step in the right direction. In the current situation of ongoing war and continuing massive human rights violations, staging elections is a strategic move designed to allow the Assad regime to continue to wage its war without threat of foreign intervention. 1. Restricting Passports - In July 2013, Assad issued a directive to its embassies abroad to stop granting or renewing passports to Syrians living outside of the country. Instead, all requests must be sent to Syria for security clearance prior to approval. Many have interpreted this as a way to further clamp down on Syrian dissidents, most of whom are either in exile abroad or in Syrian prison. Since the directive was issued, reports suggest that the regime has indeed refused to issue passports to Syrians who fled the country, and by some accounts the Interior Ministry stopped issuing passports to expats altogether. One example came to light publicly when the Syrian embassy in the UAE refused to renew the passport for Syrian actor Samer al-Masri, due to unconfirmed allegations that he supported the Syrian opposition. In February Saudi Arabia already had around 100,000 Syrians who were unable to renew their passports because they oppose the Syrian regime. “Syrian missions in all countries have blacklists with the names of Syrian residents who are involved in activities against the regime,” claimed one Syrian who was denied a renewal in Jeddah. 2. Removing Embassy Access - In March of 2014, a suspiciously-timed spate of Syrian embassy closures in countries that host large numbers of Syrian dissenters was likely aimed at preventing likely anti-Assad voters from registering and voting. Syrian Embassies in Saudi Arabia, Kuwait, and The United States were closed. This has disenfranchised an estimated 150,000 Syrians in Kuwait, nearly 1 million in Saudi Arabia, and around 150,000 in the U.S.
Due to the termination of consular services, hundreds of thousands of Syrians abroad will not have a valid passport to present. Due to the closure of embassies in countries with high dissident populations hundreds of thousands of Syrians abroad have had nowhere to register or to vote. But a critical point that should not be forgotten is that fear of their government is an overwhelming fact of life for most Syrians. After living under decades of repression and close monitoring by Syrian intelligence services, many Syrian refugees are afraid even to register personal data with the UNHCR for fear that it will fall into the hands of pro-regime operatives and they will be hunted down by Syrian intelligence. And their fears are not completely unfounded. Refugees in Lebanon, where the regime’s ally Hezbollah wields significant control, report that Lebanese men allied with Assad have gone around asking about their vote and recording names. In this context the idea that Syrian refugees – many of whom fled to escape persecution from the Assad regime – would willingly register to vote becomes almost a non sequitur. Candidates must have been a resident of Syria for at least the last ten consecutive years. This excludes opposition figures because those who have not been arrested have been forced to flee the country. Never having been convicted of a felony or misdemeanor cuts out any opposition figures who have remained in the country (and many who have fled), as the Syrian regime has a history of arresting political dissidents, and of arbitrary detentions (according to the regime’s own reporting it has tried around 30,000 Syrians on terrorism charges alone in the past two years). Most members of the opposition’s political leadership spent time in regime prisoners long before the war started for their work on democratic reforms and human rights. Current head of the Syrian Opposition Coalition, Ahmed Jarba, has been arrested twice. The two regime-vetted challengers running against Assad are little-known quantities that few are taking seriously. Many Syrian voters in Lebanon could not even remember their names. In a recent interview, one of the challengers described the Syrian conflict as the product of a “global conspiracy.” A description remarkably similar to the regime’s standard line. With all of these changes, more than half of all Syrians will be prevented from voting even if they want to. These de jure attempts at election-fixing and disenfranchisement sit on top of a mountain of de facto changes that alone would be enough to earn the elections the title of farce. Around 40% of all Syrians have been displaced from their homes, with at least 6.5 million internally displaced persons in Syria, and an additional 2.8 million registered with the UN as refugees in neighboring countries. Heavy fighting continues across the country, with the regime continuing its attacks on civilian centers, and there are large parts of Syria that are no longer under government control. 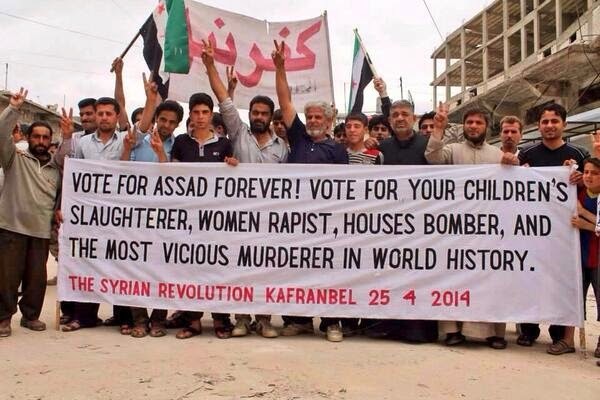 The shifting demographics mean that few Syrians who are openly anti-Assad are left in areas under regime control. Urban areas considered friendly to the opposition have been purposefully demolished. Opposition areas like central Aleppo, that the regime has had trouble reaching by land, have been subjected to unending air campaigns of barrel bombing and ballistic missiles, forcing most residents to flee. Worse still, the regime has made it difficult for the displaced to resettle in regime-held areas, preventing them from renting homes in Damascus. There are also reports that the regime is seizing property and land in depopulated areas to prevent those with pro-opposition sympathies from returning, suggesting that a sort of demographic re-engineering is taking place. Syria has invited “friendly nations” to send observers to further legitimize its elections. The list of invitees for the most part reads as a “who’s who” of quasi-authoritarian governments with lackluster democratic credentials, including Russia, Iran, China, Venezuela, Nicaragua, and Cuba. It has also reportedly refused permits to foreign journalists to cover the “historic” event. And as the voting for some Syrian expats started on May 28 in friendly countries, the reasons for preventing independent international coverage becomes apparent. In a Twitter discussion, a group of credentialed journalists from outlets including the New York Times and Reuters describe the irregular voting in Lebanon: anyone who wanted could cast one or more ballots (even non-Syrians), voters had to write their name on their ballots, and there was a widespread belief that those who did not vote, or who did not vote for Assad, would face negative consequences when they return to Syria, if they were allowed to return at all. With all of the effort towards manipulating the election, the question then becomes: why bother with an election at all? The answer is that this election is an important component of the regime’s ongoing propaganda and disinformation strategy, which has thus far paid off handsomely. Assad’s insistence that this war is about terrorism (echoed by Iran and Russia) has helped introduce enough doubt into the debate about who the regime is fighting to avoid direct foreign intervention on behalf of the opposition. The elections – like Geneva II and chemical disarmament – is another bullet in the regime’s rhetorical arsenal, giving Assad the chance to throw the language of democracy and freedom back in the face of the international community and Syrian opposition. But the election charade is a thinly veiled one, with Assad telling his Russian backers that he has no intention of stepping down even while inviting them to send election observers. Predictably, Iran supports the elections and has stated that those who oppose them also support terrorism in Syria. After Assad is “reelected” we can expect to see the theme that Assad as the legitimately elected choice of the Syrian people become the central pillar upon which Assad will justify his rule moving forward. But if there is any true belief behind the Russian and Iranian rhetoric that the upcoming elections are a path to peace in Syria, or the regime’s propaganda that Syria is on the right path despite the international community’s “plots and schemes,” then the only ones they are fooling are themselves. The Syrian presidential faux-election is galvanizing Syrian activists and coincides with increasing foreign military support to the rebels. Ironically as Assad’s campaign theme of Sawa [together] blankets the land, Syria has never been more torn apart.